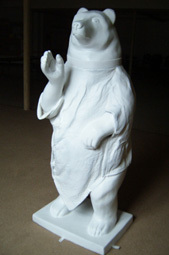 Cowpainters in Chicago fashioned the paw in its “blessing” pose and nicknamed him Blessing Bear while he lived among them. 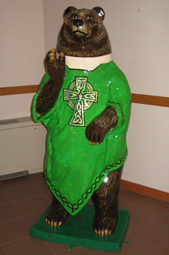 The model for Saint Columbkill’s Bear Fever bear was Pastor Robert C. Quinn who has served the church as pastor for the last 23 years. Pastor Quinn shared some of his favorite things: the film, Casablanca, church song, “On Eagle’s Wings,” artist Mozart, Bible verse: Matthew 5: 1-5: “Now when he saw the crods, he went up on a mountainside and sat down. His disciples came to him, and he began to teach them saying—“Blessed are the poor in spirit, for theirs is the kingdom of heaven. Blessed are those who mourn, for they willl be comforted. Blessed are the meek, for they will inherit the earth.” Pastor Quinn’s hobbies include music, reading and travel; he loves experiencing new vistas and meeting different people. Papa Popadickon became his nickname for the Stahls until the congregation decided on a name. 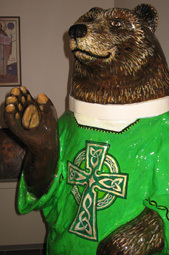 The bear features the names and logos of the sponsoring was groups: the Ancient Order of Hibernians (AOH), Holy Name Society, Ladies AOH and Congregants. 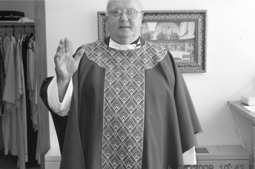 Ancient Order of Hibernians, Holy Name Society and Ladies HOH Information about the sponsoring organizations can be found on the church’s website. We are a growing, faith-filled Parish Family facing opportunities and challenges of our future, ever mindful of the strengths of our past. We are a worshiping community committed to Christ and striving to understand, appreciate, and relate to the uniqueness of all members. We seek to serve our community through Evangelization, Religious Education and a heightened awareness of social concerns. We will focus our efforts on the evolving spirituality of all our people, in particular, our families and our youth. Joe is a graduate of the University of Dayton, Ohio, and the Pennsylvania Academy of Fine Arts, Philadelphia, with degrees in drawing and painting. His journey as a young artist took him to New Mexico where he made a living as a “starving artist” sketching portraits in charcoal and pastel for tourists and teaching part time at St. John’s College. Currently Joe is working in the mental health industry and looking to resurrect his art career beyond his involvement with several annual exhibits with the Perkiomen Valley Art Association. Saint Columbkill of Iona is a Parish of the Diocese of Allentown and the world-wide communion of the Roman Catholic Church. 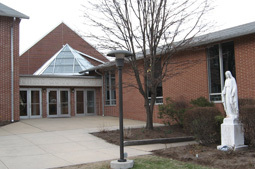 Founded in 1921, the Parish continues to grow in opportunities for spiritual development. We have made a great commitment to the children and youth of our Parish. We have an integrated religious education program for our children from preschool through 12th grade. Over 1,100 children participate in our religious education program or are enrolled in Catholic schools. We are convinced of the necessity of giving our children an understanding of their Faith that is truly alive and dynamic. We are committed to have each child have a personal relationship with Jesus Christ. It is this relationship that will carry each person through life. Saint Francis Academy is our Parish Grade School. Our students are also enrolled in St. Aloysius School, Reading Central Catholic High School and St. Pius X High School in Pottstown. These Catholic schools are committed to excellence in both proclaiming Christ and in preparing students academically. We have a junior and senior high Youth Group that meets regularly. Judy and Al Carey direct these groups. They are involved in activities, trips and Christian social action projects. We have an active network with other youth groups of the Allentown Diocese and also Steubenville University’s program for spirituality for teenagers. Being a parish of young families, we have a Family Life Ministry, headed by Sister Nancy Kramer. It is our aim to provide opportunities for spiritual growth for all family members. Part of this Ministry is a Mothers Group for young mothers as well as the Sunday Morning Children’s Liturgy of the Word during our 9am and 10:30am Masses. An important part of our family life is our senior parishioners. St. Columbkill Seniors meet monthly and have instructional, spiritual and social activities and trips that are open to all seniors. The most important event in our week is our Sunday worship. We gather as a church to praise and adore a God who is truly great and loving. The proclamation of God’s Word and the celebration of Eucharist give us the stamina and direction we need to live a life in God’s presence for the following week. We invite all who are looking for a church family to call their own to “come and see”. You are always welcome! Saint Columbkill offers masses daily. The Sacrament of Reconciliation/Confessionsis offered Saturdays from 4:00-5:00 p.m. or by contacting the parish office. 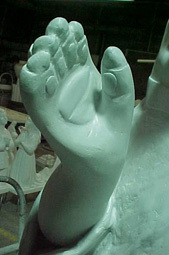 The Sacrament of Baptism, and Matrimony are offered on a regular basis; prior arrangements are necessary. A variety of services, worship groups, activities, prayer meetings, Bible Studies, fundraisers, counseling, consultations, and opportunities for learning and social interaction are offered for all age groups to meet assorted needs within the congregation.